9/1 Cup of Coffee: The Gulf Coast League finals got off to a thrilling start, with the GCL Red Sox scoring twice in the bottom of the ninth to walk-off with the win. After surrendering the lead in the eighth inning, Portland thundered back with five runs in the ninth for a comeback win. Pawtucket lost in a tough test against a top pitching prospect, Greenville's rally fell short, and Lowell dropped a slugfest. It was a stiff test for the PawSox lineup, with Red Wings ace and Twins top pitching prospect Jose Berrios (MIN) on the mound. Chris Marrero reached Berrios for his second home run since joining the PawSox, part of a 2-for-4 night for Marrero. Younger brother Deven Marrero chipped in with a hit and Allen Craig notched a pair of singles. Two of the four runs allowed by Pawtucket starter Zeke Spruill were unearned, as the right-hander struck out two and walked one while allowing eight hits in five innings. Jonathan Aro and Noe Ramirez combined for three innings of perfect relief, with Aro striking out one in his two innings of work and Ramirez fanning two of the three batters he faced. After allowing three runs in the bottom of the eighth inning to fall behind 6-4, Portland came back with five two-out runs in the ninth to grab the come from behind win. The key hit was a two-run double by Tzu-Wei Lin that gave the Sea Dogs a 7-6 lead. Lin also scored twice as part of a 2-for-5 night. Sam Travis matched him by going 2 for 5 with a double, while Oscar Tejeda hit a three-run first inning homer to start off his two-hit night. Luis Diaz had a strong start, allowing three runs on five hits in seven innings, but came away with a no-decision. Madison Younginer vultured the win, allowing the three eighth inning runs to become the pitcher of record when the offense delivered its ninth-inning rally. Kyle Martin struck out two in a perfect ninth to notch the save. A tough loss dropped the Drive out of the lead for the South Atlantic League's final playoff spot. Starter Jake Drehoff took the loss, allowing four runs (two earned) on six in 5 2/3 innings. Jeffry Fernandez gave up two (one earned) in 2 1/3. The Drive rallied for three runs in the seventh inning, capped by a two-run double by Nick Longhi. It was the second two-base hit of the night for Longhi and his 24th of the season. Andrew Benintendi remains hot, going 1 for 4 with a walk, and Rafael Devers extended his hitting streak to six games with a 2-for-4 evening. The Drive entered Monday's play in a tie with Asheville for a wild card spot. The Tourists split a doubleheader, dropping Greenville a half-game behind with seven contests remaining. Lowell allowed double-digit runs for the second consecutive day as its playoff hopes begin to fade. The Spinners generated plenty of offense, led by Kyri Washington. The right fielder was 3 for 4 with a double and a pair of RBI. Chad De La Guerra had a two-hit night, and Josh Ockimey reached base twice with a base hit and a walk. Javier Rodriguez got the start and was roughed up, allowing six runs on six hits in just 1 1/3 innings. The Renegades then reached Daniel Gonzalez for five runs, though all five were recorded as unearned. Taylor Nunez pitched out of several jams to slow. the barrage. He allowed just one run in 3 1/3 innings, despite surrendering three hits and walking three batters. Tucker Tubbs, a first baseman by trade, was called upon to pitch the ninth inning. The big right-hander scattered three hits in a scoreless inning of relief. Though it is only 2 1/2 games out of the wild card lead, Lowell has fallen into fifth place among New York-Penn League wild card contenders. The Sox are now just one game away from repeating as Gulf Coast League champions after a wild comeback Monday afternoon. The Red Sox started the series off with a bang, grabbing a 1-0 lead in the bottom of the first. Leadoff man Andy Perez singled, advanced to second on a wild pitch and then to third on a groundout. A Jerry Downs sacrifice fly plated him, giving the Sox the early advantage. The Blue Jays answered with a pair of runs in the fourth inning, and the score remained 2-1 until the bottom of the ninth. With one out in the ninth, it was again Perez who ignited the rally with a base hit. After Perez advanced on a ground out, Downs drove him in to tie the game at two in with a base hit to center field. In what proved to be a key play, a bobble in the outfield allowed Downs to advance to second, putting him in scoring position for Roldani Baldwin, the team's leader during the regular season in both hits and RBI. As he had so many times during the season, Baldwin came through with the base hit, scoring Downs and giving the GCL Sox the walk-off win in the first game of the best of three final. Starter Logan Allen cruised through three scoreless innings before allowing a pair of runs in the fourth. He surrendered six hits and struck out four without issuing a walk. The bullpen was dominant, allowing only two baserunners in five innings. First out of the pen was Travis Lakins, making his professional debut. The Red Sox sixth-round pick fired a perfect fifth inning, striking out one. 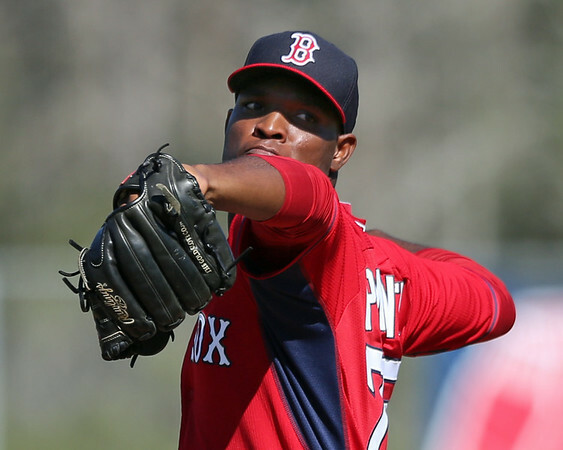 Yankory Pimentel (pictured) gave up one hit in three scoreless innings, striking out three without allowing a walk. Algenis Martinez struck out two and allowed one hit in a scoreless ninth inning, picking up the win. Player of the Day: Leadoff hitter Andy Perez was the spark the GCL Red Sox needed. A non-drafted free agent out of Duke, Perez had a stellar .431 on-base percentage in 26 games. Those on-base skills were on display Monday, as Perez singled twice, walked, stole a base, and scored two of the three Red Sox runs, hepling them to a 1-0 lead in the best-of-three Gulf Coast League finals.